At my former magazine we focused on lower-income issues, which meant we sometimes published research on topics such as prison reform, the criminalization of addiction, and job programs for ex-offenders. Recently, I saw an article that reminded me of those efforts. It’s about an unusual fine-dining restaurant in Cleveland. Jenn Hall covers the story at Paste, “Though the numbers vary by state, roughly three-quarters of ex-convicts are rearrested within five years, and more than half of those return behind bars. Ask Brandon Chrostowski about it, and he’ll tell you that it’s more than a problem. It’s a civil-rights issue — and that’s why he decided to do something about it. “For diners at Edwins Restaurant in Cleveland Shaker Square, fine French cuisine is an initial draw. The setting is nouvelle-chic, befitting a Francophile menu that garners praise. Bar service is sophisticated, with a wine list that runs deep. But the reason to return goes beyond the plate. In almost every position, both front and back of house, ex-offenders are training to launch new careers. “It’s the only white-tablecloth restaurant of its kind in the U.S.
“The trainees are part of Edwins’ six-month Restaurant and Leadership Training Program, of which Chrostowski is founder and CEO. 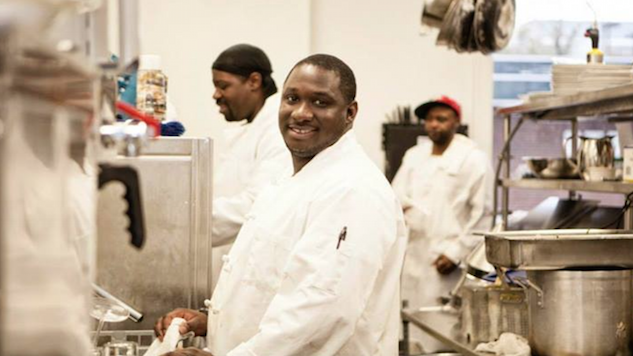 (Edwins is a portmanteau of ‘education’ and ‘wins.’) Covering everything from mother sauces to white-tablecloth service, the program aims not just to equip ex-offenders with skills, but also to power them with the confidence to apply them. “It’s a program borne of careful planning. Chrostowski first had the idea in 2004, secured approval to operate as a 501 (c) (3) in 2008, and then spent six years perfecting the pedagogy before opening the restaurant’s doors in 2013. Now, 20,000 diners visit Edwins each year. To read Hall’s interview with Chrostowski, click here. Another very inspiring blog of how to change the world….. The restaurateur is running for mayor. It would be great to have more people with his values in politics. Wouldn’t that be great, if he was elected?! This is a very interesting approach–this business of helping people, not just learn a skill, but learn their way around different social classes so they can feel comfortable with people beyond their (possibly toxic) neighborhoods. The thing about toxic neighborhoods: the residents are mostly regular folks, I think, but poor and maybe intimidated by the toxic part. Must make everything so difficult.